This image just sums up the Cork English Market and what it means to us all in Cork. Its about meeting people from all walks of life, sharing a joke, having a chat. All are welcome. The market's ethos to treat everyone equally couldn't be more evident in the welcome HM Queen Elizabeth II and HRH Prince Philip, Duke of Edinburgh received on their landmark visit to the City on Friday 20th May 2011. 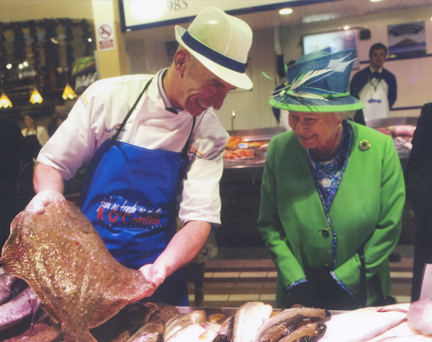 It was well reported how the Queen was at her most relaxed in Cork City and none more so that in the Cork English Market itself where she enjoyed the same banter and craic afforded any visitor to the market. The Lord Mayor of Cork, Cllr Michael O’Connell, took her on a tour of the food aisles where she met with the Market traders, being shown samples of fish, fruit, vegetables, cheese, and other farm produce at various stalls. The Queen took time to chat with several market traders, enquiring as to the history and provenance of the food produce on many of the stalls. She spoke with many traders. Near the English Market fountain, the Queen unveiled a plaque commemorating her visit to the Market. The Lord Mayor presented the Queen with a silver brooch depicting Cork’s famous butter market, which was specially commissioned to commemorate her visit. Tom Durcan, Chairman of the Traders Committee, presented Queen Elizabeth and Prince Philip with a hamper of local produce from the vendors in the market. The hamper was packed with 20 different Irish artisan food products, showcasing the best of produce from the English Market. the man who puts 2 president in the shade.